Last weekend, JSL was not feeling well. We chalked it up to one thing, but perhaps we were wrong. Monday, he was up all night screaming and yelling that his hair hurt. Tuesday morning, he had a fever and we went to the doctor to have his ear checked. After removing a giant wax plug, the doctor was able to see that there was no infection behind it. We were left to head home not knowing what was causing the fever. As the mother of a two year old child who has had four febrile seizures, the most recent in October, I am beyond nervous. Today (typing this Thursday evening), we have not been able to get JSL’s temperature down below 100 with Motrin (every 6 hours) and Tylenol (every 4 hours) around the clock. This evening, we were really worried when his temperature soared to 101.5 with both medications in his system. Right now, we are unsure if we will be heading to the ER soon. I am typing as I sit here next to my poor little puppy. 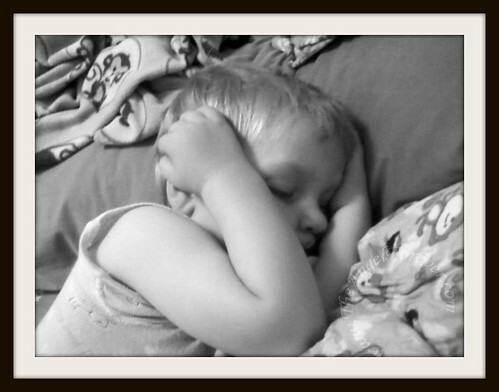 Here is a photo of the little guy protecting his ears and armpit from temperature taking tactics while he sleeps. What helps you the most when you have a fever and do not feel good? Looking for any suggestions to help my poor little guy. Oh girl…..we had our first ear infection last week (fever). Our 2 year old didn’t even know how to tell us (and she’s quite articulate). I’ve just cuddled with her and let her indulge in comfort foods with extra doses of her favorite friends on tv….exactly what I need at those times. We are slowly getting better as we didn’t use antibiotics. I’m hoping tomorrow we’ll be 100% better. Wishing your guy feels better real soon. Hugs! .-= Debra @ A Frugal Friend´s last blog ..Walt Disney World w/a Preschooler (Giveaway) =-. A nice cool washcloth on the forehead is great for a fever, if he doesn’t mind it being there. Hope he’s better soon. .-= Nancy´s last blog ..Spirit Week =-. Oh hun!! I am so sorry he is so sick!! I am super casual about illness (of course, I have never had seizures to deal with) and even I would be a wreck over a fever lasting that long. Umm… we do Motrin – I think it works better than Tylenol but you are already doing that. I don’t think I have had anything really nasty that Motrin did not help. A warm bath always makes them feel better – they will usually even play in the tub when they are sick. When I am sick all I want is sleep. Good luck!! Praying for the little guy! Fevers are never much fun, but what always helps me is a cool shower. Awwww poor baby! I say you should check it with the doctor! Take good care of him! Our thoughts are with you guys! .-= Niky @ Design It Chic´s last blog .. =-. Oh how scary! I’m so sorry you’re going through this. My girls have always been good with tylenol and a lukewarm bath. Poor little guy and poor mama…hope that your he is feeling better soon. 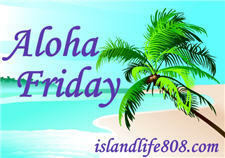 .-= Steph´s last blog ..Aloha Friday: Starstruck! And Friday Follow! =-. So so to hear about your boy. Hope the fever breaks soon. Tylenol, a lukewarm bath, lots of fluids, and some rest works for us! Gatorade & switching back and forth between tylonol & motrin. Just lying there in bed if I’m lucky enough to be able to do so. .-= Kayla ´s last blog ..Give the Gift of a Smile-EvenAndy =-. I hope he’s feeling better soon! I drink as much water and juice as I can, take tylenol, and rest. Same for the kiddos. I like someone to sit with me and stroke my hair. Poor baby, I hope he feels better! Oh it has been so long since my little girl had an ear infection, but what we always do when either one of us is sick is go on the couch with our special blue blanket and have chicken soup, 7-up, and buy sherbert which we never normally buy and just relax. At night before we go to bed, who ever is sick gets the vicks treatment and we normally feel better the next day. I do remember alternating with tylenol and motrin when she was younger with the fever and pedialyte. .-= Teresa´s last blog ..Friday Follow ~ March 5, 2010 =-.